Розглянуто статус локативно-синтетичної семантики в структурі іменниково-орудного відмінка, схарактеризовано загальний простір функційно-семантичної парадигми іменниково-орудного, визначено концептуальні основи тлумачення локативно-синтетичної семантики інструменталя Євгеном Тимченком. Через послідовний аналіз кваліфікації локативно-синтетичної семантики інструменталя лінгвістом з’ясовано тенденції збереження аналізованого значення в структурі сучасного іменниково-орудного й напрями редукування локативно-семантичної семантики в структурі іменниково-орудного, що зумовлено внутрішньокатегорійною міжвідмінковою взаємодією й конкурентністю. Останні мотивують заступання форм локативно-синтетичної семантики іменниково-орудного аналітичними формами знахідного, місцевого, почасти – родового й давального відмінків. Keywords: case, noun-ablative case, locative-synthetic semantics, analytical form, instrumental, accusative, dative, genitive. Background: In modern linguistics, the ablative case is studied in the formally-grammatical (K. Tymchenko), semantic-syntactic (R. Mrazek), O. Potebnja, in semantic, communicative aspects. R. Mrazek distinguished 16 values ​​of the ablative case, differentiating them into semantic and syntactic implementations in his studies. Emphasizing the processing of the ablative case by M. Bauerova, O. Ivich, Y. Los, O. Patokova, T. Lomtiev, O. Potebnja, E. Sydelnykov, D. Stanishchev, V. Sukhityn, Ye. Tymchenko and others, it is also necessary to mention the studies of the ablative sociative and instrumental (D. Stanishchev), ablative in passive and impersonal constructions (K. Khodova), the causative cause (K. Khodova), the ablative comparison (K. Khodova), the ablative restriction (M. Hadolina), the ablative time (L. Malakhovska), the ablative non-prepositional and prepositional place (A. Bulyhina), the ablative pre-noun (M. Hadolina), the tendencies and directions of the adverbialization of the ablative noun (T. Tykhomyrova). Particular attention is required by the thorough analysis of the noun-instrumental by Yevhen Tymchenko and the noticing of qualifications by the linguist, of the locative semantics of the ablative noun, which was not in the context of final studies, which also motivates the relevance of the study. Purpose: The purpose of the analysis is to establish the peculiarities of the interpretation of the noun-instrumental by Yevhen Tymchenko with the sequential outline of the status in his structure of the local semantics and the establishment of linear positional marking and semantic variation. In connection with this, the actualization of the following tasks was accomplished: 1) to determine the status of the noun-instrumental in the grammatical concept of the linguist; 2) to design the established functional and linear-variant varieties of the noun-instrumental for the modern section of discourse-text practice; 3) to characterize the correlation and / or disproportion of the locative semantics of the noun-instrumental with the locative semantics of other cases; 4) to qualify the force fields of the noun-instrumental locative semantics; 5) to outline the status motivations of the noun-instrumental locative semantics in the linear structure of the sentence of objective grammar. The novelty of the analysis is motivated by the substantiation of the status of locative semantics in the functional-semantic paradigm of the noun-instrumental, in general, and in the grammatical concept of Yevhen Tymchenko, in particular. The theoretical significance of the research is to determine the status of the noun-instrumental in the grammatical concept of Yevhen Tymchenko and the qualification of the noun-instrumental locative semantics in objective Ukrainian grammar. The practical significance of the study is focused on using its results in the study of the history of Ukrainian linguistics, the creation of a coherent concept of objective grammar of the Ukrainian language, the usage of separate theses in the development of training courses on topical issues of the history of grammar, the evolution of grammatical studies. Results: Particular attention deserves the consideration by Ye. Tymchenko of the locative semantics of the instrumental, which also needs to be considered as a substantive one. The analysis of the noun-ablative by Ye. Tymchenko is accomplished with the support on the form and value of individual positionally-determined manifestations, removing the function into the secondary plan. The competitive nature of the ablative with another case forms, as well as its syncretism, is due to evolution, the relation with other category-case formations. Investigation of the noun-ablative through the correlation with the core component enables a consistent examination of the pre-verb noun-ablative with the delimitation of a free ablative ("in a free relation to the verb"), which is correlated either with a separate verb or with a whole sentence. By its nature, such a noun-noun approximates to the adverb and is adverbialized with the value of the place or time, which proves the impossibility of their functional relationship with a nominative or accusative. In the analysis of the noun-ablative on the designation of the place Ye. Tymchenko differentiates the semantics of a place – a certain space or line (поле, стежка, шлях) and the meaning of the place - the designation of a point in space (ворота, двері, вікно). Prior to this, the scientist adds a distinction between verbs, which, with their valence potential, predicts the presence of the left-hand side of the subject and the right-hand component on the designation of the route. In the consideration of the ablative of a certain space or line for the original, the compatibility with the verbs of displacement is taken, in which the noun form denotes the space used to move with such verbs as бігти, пробігти, забігти, іти, зайти, пройти, прийти, піти, прибігти, блудити, блукати, приблукати, заблукати, брести, забрести, пробрести, віяти, провіяти, повіяти, їхати, заїхати, приїхати, проїхати, переїхати, від’їхати, летіти, полетіти, прилетіти, залетіти, підлетіти, пролетіти, пливти, припливти, пропливти, відпливти, запливти, перепливти, мандрувати, примандрувати, промандрувати, відмандрувати, прибути, відбути, утікати, тікати, втекти, ходити, заходити, підходити, відходити, проходити, стрибати, дострибати, відстрибати, перестрибати. With the support for differentiating in the instrumental place ʻas a certain areaʻ and ʻpoints in spaceʻ and taking into account the connection with the verb with the distinction in such a connection with the verbs on the designation of the displacement of ʻsubstituteʻ and ʻsubjectʻ and with verbs that do not express such a displacement, Ye. Tymchenko initially analyzes verbs without accusative right-hand valency (non-transitive), and then concentrates attention on the verbs of active-accusative valency: вести, завести, провести, підвести, понести, занести, піднести, віднести, перенести, гнати, прогнати, підігнати, гонити, розгонити, порозгонити, прогонити, загонити, розігнати, розганяти, сипати, розсипати, засівати, спускати, спустити. In the contemporary discursive practices, such an instrumental-noun in verbs of active-acoustic valence competes with local dynamic localization, which is the closest to the primary function of the noun-local and finds the transition plane between the primary and / or primary and secondary functions. Substantive noun-local dynamic localization in modern discourse practices is more frequent and more regular, whereas the substantive noun-ablative in such implementations appears to be less used. Competitiveness of the ablative-noun place ʻas a certain areaʻ in the evolution of the grammatical system is gradually expelled to the periphery, while in such verbal vocabulary the regular accusative valence is preserved. A similar manifestation testifies to the active intra-category semantically competitive interaction of the substantive noun-ablative place ʻas a certain areaʻ and the substantive noun-local dynamic localization, the acquisition of a consistent specialization by the form of a local. Significant is the observation of Ye. Tymchenko over the verbs, that in only one of their values ​​predict post-positive noun-ablative with the semantics of place: розкидати, засіяти/засівати, посіяти/посівати, пересіяти/пересівати. In the consideration of such verbs, the researcher focused only on those meanings, which include the expression of the noun-ablative place ʻas a certain areaʻ. Given the total capacity, for example, the lexeme-кидати, covering the five meanings ​​and their shades (the first value is four shades, the second one - one, the third one - one, the fourth - 1, the fifth - the two), and in verbal lexeme сіяти-to sow, there are eight (only seven of them have two shades, and the fifth - one) meanings. It is easy to determine the coefficient of regularity of the substantive noun-ablative place ʻas a certain areaʻ, which for кидати is 20%, and with shades - 7,1% . In сіяти, these figures are respectively 12.5% ​​and 9%. Summarizing the observation of the two analyzed lexemes, it is necessary to emphasize the peripheral realization in their right-hand position of the substantive noun-ablative place ʻas a certain areaʻ, since such an expression in modern discursive manifestations is irregular and infrequent. It seems likely that there are similar intentions among other verbs also. Ye. Timchenko in the analysis of the noun instrumental of locative-synthetic semantics draws attention to the position in constructions with verbs that do not express movement. In such cases, the form of the noun instrumental loses its strong connection with the verb. Among the constructions that do not express the displacement, a special place belongs to the formations with an ellipsoid verb-predicate like Туман яром, туман яром ще й в долині трохи; Ой тихими долинами пшениця ланами; Темними лугами стежечка, битая доріженьката, and others. An analysis of the noun-ablative of locative-synthetic semantics of the designation of a particular point is considered due to the observation of its competitiveness with nanlytic compounds of the sample. Analytic syntactic morphemes в, крізь, повз, через (↔ prepositions) + aссusative і / or analytical syntactic morpheme з (↔ preposition) + genitive. The researcher differentiates such a noun-ablative locative-synthetic semantics of a spatial point, which appears regular in verbs of translation and verbs that do not express a movement. Discussion: Yevhen Tymchenko's sight in the study of noun-ablative is significant, since the scientist has foregrounded the functional range of the instrumental, emphasizing the inequality of its locative semantics, conditioned by a) linear intra-rhetorical position; b) interaction with the semantics of the verb; c) the lexical filling of the form. With support for the evolution of semantics of the instrumental, Ye. Tymchenko defined the trends and tendencies of its competitiveness with analytical forms of accusative, dative, genitive, locative. In his observations on the instrumental, the researcher, in essence, determined the regularity of the locative semantics in the intra-sentence structure, which, together with the temporality, is a compulsory and regular intra-sentence specification. Perspective is the integral study of the grammatical views of Yevhen Tymchenko with the definition of the conceptual foundations of his observations, the definition of the intersection of comparative-historical and elementary-structural approaches, orientation to the objective language space, the importance of the people-colloquial element in the formation of the grammatical norm, its relationship with the historically fixed samples. Nadiia Zahnitko, Senior Researcher at the Department of General and Applied Linguistics and Slavonic Philology at Donetsk National University named after Vasyl Stus. Dialectology, linguopersonology, the theory of objective and subjective grammar, communicative linguistics. Ключові слова: відмінок, іменниково-орудний відмінок, локативно-синтетична семантика, аналітична форма, інструменталь, акузатив, датив, ґенітив. 1. У сучасній лінгвістиці орудний відмінок досліджуваний у формально-граматичному (К. Тимченко (Ty`mchenko)), семантико-синтаксичному (Р. Мразек (Mrazek), О. Потебня (Potebnia), семантичному (Vykhovanets), комунікативному (Zahnitko 20І7) аспектах. У дослідженнях Р. Мразек (Mrazek) вирізнив 16 значень орудного відмінка, диференціюючи їх на семантичні й синтаксичні реалізації. Наголошуючи на опрацюванні орудного відмінка М. Бауеровою, О. Івічем, Й. Лосем, О. Патоковою, Т. Ломтєвим, О. Потебнею, Є. Сидельниковим, Д. Станіщевим, В. Сухітиним, Є. Тимченком та ін. До цього потрібно також прилягають студіювання орудного соціативного й інструментального (Д. Станіщева (Stanischeva)), орудного в пасивних та безособових конструкціях (К. Ходова (Khodova)), орудного причини (К. Ходова (Khodova)), орудного порівняння (К. Ходова (Khodova)), орудного обмеження (М. Гадоліна (Gadolina)), орудного часу (Л. Малаховська (Malakhovs’ka)), орудного безприйменникового та прийменникового місця (А. Булигіна (Bulygina)), орудного приіменного (М. Гадоліна (Gadolina)), тенденцій і напрямів адвербіалізації орудного іменникового (Т. Тихомирова (Tikhomirova)). Особливої уваги вимагає ґрунтовний аналіз іменниково-інструментального Євгеном Тимченком та простеження кваліфікації лінгвістом локативної семантики іменникового орудного, що не перебувала в розрізі викінчених студіювань, що й мотивує актуальність дослідження. Погляди Є. Тимченка на відмінкову систему побіжно студійовано І. Вихованцем (Vykhovanec’), Н. Костусяк, М. Масицькою, О. Межовим, М. Скабом та ін. Метою аналізу постає встановлення особливостей тлумачення іменниково-інструментального Євгеном Тимченком із послідовним окресленням статусу в його структурі локативної семантики та встановленням лінійно-позиційного маркування та семантичного варіювання. У зв’язку з цим актуалізовано вирішення таких завдань: 1) визначити статус іменниково-інструментального в граматичній концепції лінгвіста; 2) спроектувати встановлені функційні та лінійно-позиційні різновиди іменниково-інструментального на сучасний зріз дискурсивно-текстових практик; 3) схарактеризувати співвідношення і/чи неспіввідношення локативної семантики іменниково-інструментального з локативною семантикою інших відмінків; 4) скваліфікувати силові поля іменниково-інструментального локативної семантики; 5) окреслити статусні мотивації іменниково-інструментального локативної семантики в лінійній структурі речення об’єктивної граматики. Новизна аналізу мотивована обґрунтуванням статусу локативної семантики у функційно-семантичній парадигмі іменниково-інструментального загалом та в граматичній концепції Євгена Тимченка зокрема. Теоретичне значення дослідження полягає у визначенні статусу іменниково-інструментального в граматичній концепції Євгена Тимченка та кваліфікації іменниково-інструментального локативної семантики в об’єктивній українській граматиці. Практичне значення студіювання зорієнтоване на використання його результатів у дослідження історії українського мовознавстві, створення цілісної концепції об’єктивної граматики української мови, використанні окремих тез в опрацюванні навчальних курсів з актуальних питань історії граматики, еволюції граматичних eчень. 2. Навіть побіжний погляд на спадщину видатного українського лінгвіста Євгена Тимченка переконує в багатоаспектному розгляді іменникового інструменталя з послідовним розмежуванням у його структурі інструментального місця (Ty’mchenko 19–28), інструментального часу (Ty’mchenko 28–31), інструментального соціативного (Ty’mchenko 32–33), інструментального знаряддя або середника чинності (Ty`mchenko 33–43), інструментального матерії чинності (Ty`mchenko 43–51), інструментального суб’єкта й об’єкта чинності (Ty’mchenko 51–55), інструменталь супровідної чинності чи стану (Ty’mchenko 63–66), інструменталь супровідної обставини (Ty’mchenko 66–71), інструменталь причинового стосунку (Ty’mchenko 62–72). Сучасний термін орудний співвідноситься із уживаним Євгеном Тимченком терміном інструменталь. Сьогодні останній термін здебільшого використовують на позначення відповідної синтаксеми (І. Вихованець (Vy`xovanecz`) та ін.) чи словотвірної категорії (І. Вихованець (Vy`xovanecz`), К. Городенська (Horodens’ka), М. Ландер (Lander 407–411), Л. Мурзіна (Murzina 1996, s. 64–67) та ін.). У дослідженнях в центрі уваги перебувають лексична й граматична семантика, словотвірний потенціал інструменталя, вияв тенденцій та умов згортання семантико-синтаксичної структури речення й утворення дертиватів інструментальної семантики, співвідношення семантичної та формально-граматичної структур твірного й похідного речень. На позначення такого зразка інструментально-субстанційної семантики використовують також термін інструментив (→ інструментатив), наголошуючи на його денотативній ролі інструментного типу – позначає «рухливі чи нерухливі прилади, що допомагають агенсу виконувати акціональні, інтелектуальні чи творчі дії. Такі інструменти можуть бути рухливими (предметний компонент фізичної діяльності як спеціалізований / неспеціалізований: Василькою свою дерев’яною шаблею рубав усі бур’яни (Valer'yan Pidmohy`l`ny`j); Цвяхом викарбовувала дівчинка літери на камені (My`kola Trublayini)» (Zahnitko 2012/2, s. 369–370). Реалізація субстанційного інструментива (↔ інструментатива) формою орудного відмінка є валентнозумовленою й позиційно закріпленою в лінеарнореченнєвій структурі. У концепції інструменталя Євгена Тимченка такий вияв інструменталя кваліфіковано як регулярний при дієсловах об’єктивних: Нашарування кори Венери зсунулися, наче хтось спеціально для нас ножем зрізав їх (Volodymyr Vladko); Захвилювався він лише тоді, коли ззаду до нього підкрався пан Фляк, зав'язав чорною хустиною очі і підштовхнув до драбини (Yurij Vy`nny`chuk). Особливої уваги вимагає розгляд Євгеном Тимченком локативно-синтетичної реалізації інструменталя. 3. У монографії «Вокатив і інструменталь в українській мові» (1926) дослідник концентрує увагу на встановленні закономірностей лінійного підпорядкування іменникового інструменталя, що мотивує диференціювання інструменталя у вільнім стосунку до дієслова (Ty`mchenko 19–31) й інструменталя у тісному (щільному) стосунку до дієслова (Ty`mchenko 32–89). Водночас враховано функційну відношення іменникового інструменталя до номінатива як частини до цілого й цілого до частини (Ty`mchenko 75–79), а також еволюційне заступання формами іменникового інструменталя форм номінатива, датива й акузатива з послідовним розглядом інструментального предикативного (Ty`mchenko 79–88), інструментального апозиційного (Ty`mchenko 88–89). Іменниково-інструментальний апозиційний, на думку дослідника, «вказує на ознаку, що не надається підметові чинністю дієслова, себто час що з ним зв’язана, а ознаку, що в момент чинности уявляється вже їм властивою, готовою, даною в них» (Ty`mchenko 88), пор. : Через тяжку кривду, якої він зазнав од польського пана Чаплинського, що, взявши з собою два десятки озброєних харцизів, захопив у Хмельницького його батьківщину − село Суботів − і при цьому забив на смерть канчуками меншого сина Богдана, а його другу жінку взяв собі коханкою (Andrian Kashhenko) (↔ взяв за коханку). Іменниково-інструментальний апозиційний в українській мові, вважає Є. Тимченко, постав на місці номінатива, акузатива й датива: Де горювала мати вдовою і згадувала молодий вік, нехай спочиває до години, коли всі будуть покликані (Vasy`l` Barka) (↔ горювала мати вдова); Не плач, мати, не журися, бо вже син твій оженився, та взяв жінку паняночку, в чистім полі земляночку (Marko Vovchok) (↔ взяв паняночкою); Коли він порахував і подивився на Вадима, той аж усміхнувся: зовсім той Осьок, який колись хлопцем радів якомусь дарункові (Volody`my`r Vy`nny`chenko) (↔ градів хлопець). Для розгляду іменниково-інструментального істотним постає послідовне врахування його внутрішньореченнєвого лінійного розташування з визначенням особливостей іменниково-інструментального придієприкметникового (Між цими, вкрай виснаженими людьми, виявився й колишній викладач Київської військової школи ім. Каменєва, котра майже всім складом викладачів і курсантів була в 30-ті роки арештована – не знаю, за що, – й тяжко покарана поза відкритим судом (Bory`s Antonenko-Davy`dovy`ch)), приіменникового, що охоплює девербативи (валентнозумовлений та позиційно закріплений), іменниках, що окреслюють певний простір – межі такого простору: дорога, стежка, шлях та ін. (Ми сіли й під крик та махання шапками поїхали додому, загубивши Емму й щасливого Паблеса (Volody`my`r Vy`nny`chenko)), приприслівникового, здебільшого у позиції при відприкметникових прислівниках (високо, вузько, сумно, тісно, широко, щільно і под. ): Коли б Бог дав, щоб трьома днями перед смертю полегшало (Nomy`s) (приклад Є. Тимченка (Ty`mchenko)), а також аналізованого іменникового інструментального при словах зразка бринь, брязь, глип, грюк, дриґ, кив, кліп, лусь, морг, стук, туп, хлясь, цок, шурх (за Є. Тимченком (Ty`mchenko), межи слівцях): А вiн розсердився та грюк дверима, та з хати!.. (Bory`s Grinchenko). Ґрунтовним є аналіз іменниково-інструментального безприйменникового (↔ синтетичного) й іменниково-інструментального прийменникового (↔ аналітичного) з коментуванням особливостей вживання останнього з прийменниками з (із, зі, зо), за, між (межи), поміж (проміж), над (понад), перед (наперед, поперед), під (попід) із виявом внутрішньої конкурентності прийменникового та безприйменникового й розглядом кожного прийменника в придієслівній, приіменниковій, приприкметниковій, приприслівниковій позиціях, а також урахування дієслівної перехідності і/чи неперехідності та ін. 4. Торкаючись історії вивчення орудного, Є. Тимченко (Ty`mchenko) наголошує на тому, що К. Бругман (Brugmann) розмежував у значенні цього відмінка соціативне (щось із чимось, разом) й інструментальне (за допомогою чого). Заявлену диференціацію поглиблював А. Мйє (Meillet). Для Є. Тимченка (Ty`mchenko) функції іменниково-орудного співвіднесені з його формальними й семантичними внутрішньореченнєвими виявами. Говорячи про дві подібні сполуки слів морити голодом і мерти голодом, науковець стверджує, що в першій «залежно від об’єктивної (каузативної) форми дієслова її [обставину – А.З.] дається уявити знаряддям, а в другім, присуб’єктивній [суб’єктній, особовій – А.З. ], – причиною» (Ty`mchenko). Істотним є те, що в сполуках мастити пензлем, годувати ложкою і мастити фарбою, годувати кашею, на думку лінгвіста, відмінність функцій орудного захована в значенні іменника з урахуванням значення дієслова, натомість для сполук гнати лозиною і гнати гуси стадом, краяти хліб ножами і краяти хліб шматками відмінність функцій оперта на співвідношення інструменталя й акузатива. У подібному твердженні логічно враховано співвідношення первинного і вторинного заповнення лінійної внутріщньореченнєвої валентнозумовленої позиції: Осінь сумовитим пензлем малювала на кущах, на деревах пишні пурпурно-золоті шати (Oles` Berdny`k); Часто годував ложкою хлопчик кошеня, аби чітко дотримуватися норми (Sil`s`ki visti.2010.15.09), де пензлем, ложкою є знаряддям; Тільки тоді тут лежав довжелезний килим, а підлога завжди була натерта червоною фарбою (Ivan Bagryany`j); Будий всіх годував кашею крутою та коржами з конопляною олією (Yurij Lohvy`n), де фарбою, кашею – речовина. Свого часу О. Потебня (Potebnya ½ 483-484) звернув увагу на кваліфікацію модальної функції іменниково-орудного відмінка. Визначення такої функції мотивоване найближчим зв’язком із називним (↔ знахідним) або ж самим дієсловом. З опертям на заявлену тезу Є. Тимченко розглядає словосполуку морити людей голодом, де голодом постає і як виразник інструментальності, і як виразник модальності (Ty`mchenko 29), що підтверджує тезу про синкретизм форми іменниково-орудного. Істотною постає семантика самого іменника – форми орудного. У конструкції морити людей голодом лексема голодом позбавлена субстанційності, підтвердженням чого є його тлумачення в словниках: 1) ʻгостре відчуття потреби в їжі, сильне бажання їсти'; 2) ʻвідсутність або гостра нестача хліба та інших продуктів харчування через неврожай або з інших причин у населеному пункті, районі, країні тощо’; 3) ʻна кого – що і з означ., перен. Гостра нестача кого-, чого-небудь украй необхідного’ (SUM 11/2: 113), де ключовими постають відчуття (1), відсутність (2), нестача (3), пор., наприклад: Прийшли москалі − ми знову в тюрмах і таборах, бо Совіцькій Союз − не наша держава. Він убивав нас, мордував, морив голодом, морозив у Сибіру (Andrij Kokotyuxa); Якось наглядач спробував поговорити. Оксен не озвався. За це два дні морили голодом (Roman Andriyashy`k) − перше значення. Предикатність лексеми голод репрезентує окрему пропозицію й гіпотетично співвідносна з прислівником голодно, що в такого зразка конструкціях не може бути вживаним. Субстанційність іменниково-орудного посилюється в ріднорядних утвореннях зразка: Ми, здесятковані терором і голодами, можемо проґавити нагоду, проґавити... державність (Oleksa Izars`ky`j). На лексико-семантичну субстанційність зорієнтована й категорійна множина. 5. Особливої уваги заслуговує розгляд Є. Тимченком (Ty`mchenko) локативної семантики інструменталя, яку також потрібно зарахувати до субстанційної. Аналіз іменниково-орудного Є. Тимченко зреалізовує з опертям на форму й значення окремих позиційно зумовлених виявів, відсторонюючи функцію на вторинний план. Конкурентний характер орудного з іншими відмінковими формами, як і його синкретизм, зумовлений еволюцією, співвідношенням з іншими категорійно-відмінковими утвореннями. Дослідження іменниково-орудного через співвідношення зі стрижневим компонентом уможливлює послідовний розгляд придієслівного іменниково-орудного з розмежуванням вільного орудного («у вільнім стосунку до дієслова»), що співвіднесене чи з окремим дієсловом, чи з цілим реченням. За своїм характером такий іменниково-іменниковий наближений до прислівника й адвербіалізується зі значенням місця або часу, підтвердженням чого постає неможливість їх функційного співвідношення з номінативом чи акузативом. В аналізі іменниково-орудного на позначення місця Є. Тимченко (Ty`mchenko) диференціює семантику місця – певного простору чи лінії (поле, стежка, шлях) і значення місця – позначення точки в просторі (ворота, двері, вікно). До цього науковець додає розрізнення дієслів, що своїм валентним потенціалом прогнозують наявність лівобічного суб’єкта переміщення й правобічного компонента на позначення траси: Мусульманин їхав дорогою, на візку, запряженім буйволом, і горланив немудрящу пісеньку (My`kola Dashkiyev); Зінька на луці, як покликав на поміч наймита й Васюту, що на той час ішов вулицею (Bory`s Hrinchenko); Йшла (Руфина – А.З.) селом горда, розфуфирена, з наквецяними губами, з головою непокритою (Volody`my`r Ly`s). У розгляді орудного певного простору чи лінії за вихідне взято сполучуваність із дієсловами переміщення, де іменникова форма позначає використовуваний простір переміщення при дієсловах зразка бігти, пробігти, забігти, іти, зайти, пройти, прийти, піти, прибігти, блудити, блукати, приблукати, заблукати, брести, забрести, пробрести, віяти, провіяти, повіяти, їхати, заїхати, приїхати, проїхати, переїхати, від’їхати, летіти, полетіти, прилетіти, залетіти, підлетіти, пролетіти, пливти, припливти, пропливти, відпливти, запливти, перепливти, мандрувати, примандрувати, промандрувати, відмандрувати, прибути, відбути, утікати, тікати, втекти, ходити, заходити, підходити, відходити, проходити, стрибати, дострибати, відстрибати, перестрибати: Тади біжить вуличкою нашою до загати, кричить як скажений: «Я втоплюся, втоплюся!..» (Volody`my`r Drozd) → біжить вуличкою; Пігмаліон схопився на ноги, метнувся з тераси і побіг селищем навздогінці за нею, не помічаючи здивованих роботів (Volody`my`r Drozd) → побіг селищем; Але ми блукаємо здичавілим парком (І. Карпа) → блукаємо парком; Маленький хлопчик бреде глибочезними сніговими заметами, вгрузаючи в них ледве не по пояс (Iren Karpa) → бреде заметами; Десь ночами вихоплювалися люди з домів і гнали лісами, стежками, стрибали через плоти й канави (Hnat Xotkevy`ch) → гнали лісами; Він мандрував світами кільканадцять років і не мав ані найменшого уявлення про те, що робиться за морем, удома (Ivan Bilyk) → мандрував світами; Вулицею їде підвода, на ній, зручно вмостившись на сіні, величається тодішній голова колгоспу (Oles` Berdny`k) → їде вулицею; Чи то блукаючи зі своїми учнями за містом, лугами й лісами, чи пливучи морем, усюди і в усьому – у хлюпотінні хвиль, у шелестінні дерев, у тріпотінні крил (Yurij Vy`nny`chuk) → пливучи морем; З дивувало мене, що такої непевної пори ходить полем сама (My`kola Andrusyak) → ходить полем. 6. З опертям на диференціювання в інструментальному місця ʻяк певної площіʼ і ʻточки в просторіʼ та врахування звʼязку з дієсловом із наголошенням відмінностей у такому звʼязку з дієсловами на позначення переміщення ʻпідметаʼ і ʻпредметаʼ та з дієсловами, що такого переміщення не виражають, Є. Тимченко (Ty`mchenko) спочатку аналізує дієслова без акузативної правобічної валентності (неперехідні), а потім концентрує увагу на дієсловах активно-акузативної валентності: вести, завести, провести, підвести, понести, занести, піднести, віднести, перенести, гнати, прогнати, підігнати, гонити, розгонити, порозгонити, прогонити, загонити, розігнати, розганяти, сипати, розсипати, засівати, спускати, спустити: Послав морями гетьман своїх воїнів (Andrian Kashhenko) → послав морями воїнів; І уявляєте взагалі, що про нас потім понесуть селом? (Andrij Kokotyuxa) → що понесуть селом; Звісно, порозгонила б Ганька цих котюг лінивих городом, та жаліє (Haly`na Tarasyuk) → порозгонила б котюг городом; Порозганяли воїни звірину лісом, і тепер марно було шукати здобич (Ivan Bily`k) → порозганяли звірину лісом; Вітер порозкривав вікна, порозкидав книжки полем (Bogdan-Igor Antony`ch) → порозкидав книжки полем. У сучасних дискурсивних практиках такий інструментально-іменниковий при дієсловах активно-акузативної валентності конкурує з місцевим динамічної локалізації, що найближче розташована до первинної функції іменниково-місцевого і виявляє перехідну площину між первинною і/чи первинними та вторинними функціями (за (Zahnitko 2017, s. 80): Попід садком річка широко в берегах іде (Marko Vovchok) → *берегами іде; − Тутка-во йди по мосту і по стежці, − скерував він Луку (Sofiya Andruxovy`ch) → *йди мостом і стежкою. Субстанційний іменниково-місцевий динамічної локалізації в сучасних дискурсивних практиках є частотнішим і регулярнішим, натомість субстанційний іменниково-орудний у таких реалізаціях постає менш використовуваним: Нас вигнали з наших домівок і розсіяли по сибірських просторах (Yurij Bedzy`k) → *розсіяли просторами; Тож нашого цвіту розсіяно по світу немало (My`roslav Dochy`necz`) → *розсіяно світом; Вітер виринув відкись із нетрів чорних Брянських лісів, шарпонув слова, зібгав їх і розкидав по білій далині (Bory`s Antonenko-Davy`dovy`ch) → *розкидав далиною; Свічка блимає, тріщить, гонить по стелі й кутках димні тіні, карлючить лице старого Штора гримасами (Volody`my`r Vy`nny`chenko) → *гонить стелею й кутками; Вони підкотили до будинку в розкішному ЗІМі, шофер поніс по сходах важкий жовтий чемодан (Oles` Berdny`k) → *поніс сходами; Внизу, коло берега, каламутно вирувала бистра ріка, в небі сходив місяць і щедро розсипав по воді золоті дукати (Bory`s Antonenko-Davy`dovy`ch) → *розсипав водою. Конкурентність орудно-іменникового місця ʻяк певної площіʼ в еволюції граматичної системи поступово витіснено на периферію, водночас у таких дієслівних лексем регулярну акузативну валентність збережено. Подібний вияв свідчить про активну внутрішньокатегорійну семантично конкурентну взаємодію субстанційного іменниково-орудного місця ʻяк певної площіʼ та субстанційного іменниково-місцевого динамічної локалізації, набуття послідовної спеціалізації формою місцевого. 7. Істотним постає спостереження Є. Тимченка (Ty`mchenko) над дієсловами, що лише в одному зі своїх значень передбачають постпозитивний іменниково-орудний зі семантикою простору: розкидати (← кидати: ʻ1. Махнувши рукою (руками), примушувати летіти, падати те, що є в руці (в руках)’ (SUM 11/4, s. 143), засіяти/засівати, посіяти/посівати, пересіяти/пересівати (← сіяти: ʻ1. Кидати зерно, насіння звичайно в оброблену землю, певним способом розтрушуючи, розсипаючи його’ (SUM 11/9, s. 236)), в інших значеннях такі лексеми позбавлені активної валентності з іменниково-орудним субстанційним, пор. : кидати: ʻ2. що, перен. Спрямовувати, поширювати (промені, світло, тінь і т. ін. )ʼ, ʻ3. що і без прям. дод., перен. Швидко, часом недбало казати, висловлювати (репліку, слово і т. ін. )ʼ, ʻ4. кого, що. Залишати кого-, що-небудь; покидатиʼ, ʻ5. кого, що. Посилати, направляти когось, щось куди-небудьʼ (SUM 11/4, s. 143) чи сіяти: ʻ2. що і без прям. дод. Висіваючи зерно, насіння, займати ним яку-небудь ділянку землі; засіватиʼ, ʻ3. що, етн. Розсипати по хаті, кімнаті зерно, вітаючи з Новим роком; посіватиʼ, ʻ4. що, біол. Поміщати мікроорганізми в живильне середовище для вирощуванняʼ, ʻ5. що, перен. Поширювати серед людей (освіту, ідеї, чутки і т. ін. )ʼ, ʻ6. що. Пропускаючи що-небудь через сито, решето і т. ін., відокремлювати менші часточки від більших, очищати від сторонніх домішокʼ, ʻ7. що і без прям. дод., перен. Розсипати рясні опади (про хмару)', ʻ8. що, у сполуч. зі сл. с в і т л о , п р о м і н н я , перен. Поширювати перев. неширокою смугоюʼ (SUM 11/9, s. 236). У розгляді таких дієслів дослідник зосередив увагу лише на тих значеннях, що передбачають вияв іменниково-орудного місця ʻяк певної площіʼ. Якщо врахувати загальну ємність, наприклад, лексеми кидати, що охоплює п’ять значень та їхніх відтінків (перше значення – чотири відтінки, друге – один, третє – один, четверте – 1, п’яте – два), а в дієслівної лексеми сіяти наявні вісім (із них лише сьоме має два відтінки, а п’яте – один) значень, то легко встановити коефіцієнт регулярності субстанційного іменниково-орудного місця ʻяк певної площіʼ, що для кидати становить 20 %, а разом із відтінками – 7,1 %. У сіяти ці показники становлять відповідно: 12,5 % та 9 %. Узагальнюючи спостереження над аналізованими двома лексемами, потрібно наголосити про периферійну реалізацію в їх правобічній позиції субстанційного іменниково-орудного місця ʻяк певної площіʼ, оскільки такий вияв у сучасних дискурсивних виявах є нерегулярним і нечастотним. Ймовірною постає вияв подібних інтенцій і з-поміж інших дієслів. Є. Тимченко в аналізі іменникового інструменталя локативно-синтетичної семантики звертає увагу на його позицію в конструкціях із дієсловами, що не виражають переміщення. У таких випадках форма іменникового інструментального втрачає свій сильний зв’язок із дієсловом, тому «В цім разі інструменталь означує просторонь, що десь її протягом або в різних її точках відбувається чинність, звідти той відтінок дистрибутивности, що мають такі сполучення, найбільше коли речівник кладеться в множині» (Ty`mchenko 22). У розглядуваних конструкціях зразка берегом (доріжка) була, байраком сумно-сумно, дивиться яром, вкосом дивиться, виросла слідом (шальвія та рута), горами будуть співати, зашуми дібровою, степом-полем (трава) зеленіє, польом (сонейко) гріє, садом (листоньки) шумлять, городами (маки) зацвіли, світи (місяце й зоря) улицею, засвіти (місяченьку) долинами, орала (Марія) долинами, лугами та берегами розвивалися (віти), лугами-берегами покошено, долом брала (дівчина), горами-ярами (туман) налягає, нема містами, (калюжі) були лісом, (я) арештами мала сидіти, переходом зацвіли (волошки), (святії) ослоном сіли, гаєм (пташечки) співають, селом погасили, горами переп’ята (стежечка), стороною (люде) сплять, селом (бояри) гуляли та ін. (тут і далі аналізовано здебільшого фактичний матеріал, наявний у монографії Є. Тимченка (Ty`mchenko). Для зручності з фактичного матеріалу наведено лише синтагмальні моделі з іменниково-орудним). З-поміж конструкцій, що не виражають переміщення, особливе місце належить утворенням з еліпсованим дієсловом-присудком на кшталт Туман яром, туман яром ще й в долині трохи; Ой тихими долинами пшениця ланами; Темними лугами стежечка, битая доріженька; Радість велика святою землев (землею – А.З. ); (Хлопців) були школами, докив не мали по вісімнадцять років, Мід з медами, погарі столами (Ю. Федькович), Ісус Христос на престолі, ангели краями, Яром, яром, пшениченька яром, горою овес (за (Ty`mchenko)) та ін. 8. За твердженням Є. Тимченка (Ty`mchenko), орудний локативно-синтетичної семантики на позначення простору «як площі або лінії» співвідноситься з аналітичними конструкціями локативної семантики, де основним засобом реалізації такого значення постає аналітична синтаксична морфема (↔ прийменник) спільно з відмінковим закінченням: по + -і («по з дативом-льокативом (внаслідок функціонального і почасти формального збігу цих відмінків» (Ty`mchenko 24), по + -ах (лише місцевий відмінок): Високий незнайомець десь зник. Знаєте, як я намучився? Ходив лісом (My`kola Trublayini); Я, прошу ласки вельможного пана ватажки, я ходив по лісу за дровами (Ivan Franko). Аналіз іменниково-орудного локативно-синтетичної семантики позначення певної точки розглянуто через заувагу його конкурентності з нанлітичними сполуками зразка аналітичні синтаксичні морфеми в, крізь, поуз, через (↔ прийменник) + акузатив і/чи аналітична синтаксична морфема з (↔ прийменник) + ґенітив, Дослідник диференціює такий іменниково-орудний локативно-синтетичної семантики просторової точки, що постає регулярним при дієсловах переміщення та дієсловах, що переміщення не виражають. З-поміж першої групи констатовано співвідношення і/чи паралелізм конструкцій на кшталт віконцем (сонце) сходить, віконцем (місяць) заходить, райськими дверми (Господь) ходить, вліз вікном (чоловік), повій (вітроньку) вікном, (Савиха молодая) вікном утікала, заглядали (свати) вікном, вікном (подарунки) будуть вилітати, вікном (сокіл) літає, вискочу вікном, дверцятами не ходити, кватиркою вискочила, вихопив вікном ↔ у вікно утікати, через віконце утікати, пор. також: Він був дуже веселий, відчинив віконниці, що полишив був лише приперті, і вліз вікном до кімнати, ще й крикнув сміючись голосно, що се простіша й вигідніша дорога (Ivan Franko); Адже ряжанка у вас, Богдане, була цвіла, я сама бачила. І звідки ти взявся тут? Мабуть, вліз через вікно? (Volody`my`r Vladko); Кажуть, перун комином влетів, по хаті покрутився і вікном вискочив у стріху (Bohdan Lepky`j); Доктор розлютовано вискочив через вікно й випалив з револьвера (My`kola Ivchenko); Усі присутні, бачилось, були тої самої думки, і припущення, що якийсь нічний волоцюга коло пів до 11-ої допустився злочину, потім утік вікном, яким уліз уперед (Ivan Franko); «Отож утік через вікно», − з жалем вимовив Станіслав (My`kola Trublayini). Окремим із дієслівних лексем властивий щільний зв’язок з іменником – найменуванням траси: ходити, утікати, вискочити. В окремих аналізованих ситуаціях іменниково-орудний є семантично синкретичний, пор. : Кривда людськая боком (локативна + означально-способова) вилазить (Nomy`s), Червоною та калиною (локативна + означально-способова) по воду йшла (V. Chuby`ns`ky`j) (за (Ty`mchenko)). Іменниково-орудний локативно-синкретичний при дієсловах, що переміщення не виражають, або перебуває у формі прилягання (стрілити вікном, віконцем гріє), або у формі слабкого керування (вздріти вікном ↔ вздріти через вікно, заглядати діркою ↔ заглядати через дірку). У сучасній мові такий іменниково-орудний локативно-синкретичний поступився поступився аналітичним конструкціям зразка аналітичні синтаксичні морфеми в, крізь, поуз, через (↔ прийменник) + акузатив і/чи аналітична синтаксична морфема з (↔ прийменник) + ґенітив, аналітичні синтаксичні морфеми по + локативно-місцевий, пор. : Збуджена веселим вечором Марта ходила взад-вперед, заглядала у вікно (Sofiya Andruxovy`ch); Він геть схиблений і навіть не здає собі справи з того, що стріляв у вікно королівського кабінету (oleksandr Avramenko). 9. Прозірливість Євгена Тимченка (Ty`mchenko) в дослідженні іменниково-орудного є знаковою, оскільки науковець зактуалізував функційний діапазон інструменталя, наголосив на нерівнорядності його локативної семантики, зумовленої а) лінійною внутрішньореченнєвою позицією; б) взаємодією із семантикою дієслова; в) лексичним наповненням форми. З опертям на еволюцію семантики інструменталя Є. Тимченко визначив напрями й тенденції його конкурентності з аналітичними формами акузатива, датива, ґенітива, локатива. Дослідник у своїх спостереженнях над інструменталем, по суті, визначив регулярність локативної семантики у внутрішньореченнєвій структурі, яка спільно з темпоральністю є обов’язковим і регулярним внутрішньореченнєвим специфікатором. 10. Перспективним є цілісне студіювання граматичних поглядів Євгена Тимченка з визначенням концептуальних основ його спостережень, визначенням перетину порівняльно-історичних та елементарно-структурних підходів, орієнтуванням на об’єктивно мовний простір, наголошенням значущості народно-розмовної стихії у становленні граматичної норми, її співвідношення з історично фіксованими зразками. Bulyigina, Anna S. “Tvoritelnyiy mesta bespredlozhnyiy (The instrumental case of a place without preposition)”. Tvoritelnyiy padezh v slavyanskih yazyikah / pod red. S.D. Bernshteyn (The instrumental case in Slavic languages). – Moskva: AN SSSR, 1958. 246−265. Print. Bulyigina, Anna S. “Tvoritelnyiy mesta s predlogami (The instrumental case of a place with prepositions)”. Tvoritelnyiy padezh v slavyanskih yazyikah / pod red. S.D. Bernshteyn (The instrumental case in Slavic languages). Moskva: AN SSSR, 1958. 266−288. Print. Vykhovanets, Ivan. Nary`sy` z funkcional`nogo sy`ntaksy`su ukrayins`koyi movy` (Essays on the functional syntax of the Ukrainian language). Kyiv: Naukova dumka, 1992. 222. Print. Gadolina, Mariya A. “Tvoritelnyiy ogranicheniya (The instrumental case Restriction’s)”. Tvoritelnyiy padezh v slavyanskih yazyikah / pod red. S.D. Bernshteyn (The instrumental case in Slavic languages). – Moskva: AN SSSR, 1958. 201−221. Print. Gadolina, Mariya A. “Tvoritelnyiy priimennoy (The instrumental case named)”. Tvoritelnyiy padezh v slavyanskih yazyikah / pod red. S.D. Bernshteyn (The instrumental case in Slavic languages). – Moskva: AN SSSR, 1958. 289−312. Print. Horodens`ka, Katery`na. “Problema vy`dilennya slovotvirny`x katehorij (The problem of separating word-building Categories)”. Movoznavstvo (Linguistics) 6 (1994): 22–28. Zahnitko, Anatolij. Slovny`k suchasnoyi lingvisty`ky` : ponyattya i terminy` : U 4-x t. (Dictionary of modern linguistics: concepts and terms: in the 4 Vol.). Donecz`k: DonNU, 2012. – T. 1. – 402 s.; T. 2. – 350 s.; T. 3. – 426 s.; T. 4. – 388 s. Print. Zahnitko, Anatolij, Zahnitko, Nadiya. “Hramaty`ka miscevogo vidminka: funkcijno-preskry`pty`vny`j aspect (Local Grammar: Functional and Prescriptive Aspect)”. Linhvisty`chni doslidzhennya 48 (Linguistic research) 2017: 76–84. Print. Kovaly`k, Ivan. Do py`tannya pro ponyattyevi i movni kateрoriyi (The question of conceptual and linguistic Сategories). Movoznavstvo (Linguistics) 1 (1987): 16–20. Print. Lander, Majya. “Mexanizm formuvannya slovotvirnoyi kategoriyi instrumentalya yak samostijnoyi kategoriyi nepredy`katnogo ty`pu (The mechanism of formation of the word-building category of the instrument as an independent category of the unpredictable type)”. 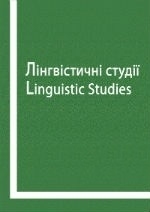 Lingvisty`chni studiyi (Linguistic studies) 15 (2007): 407–411. Print. Malahovskaya, Lidiya S. Tvoritelnyiy vremeni (The instrumental case of time). Tvoritelnyiy padezh v slavyanskih yazyikah / pod red. S.D. Bernshteyn (The instrumental case in Slavic languages). – Moskva: AN SSSR, 1958. 222−246. Print. Martyinov Viktor V. Kategorii yazyika: Semiologicheskiy aspekt (Language categories: Semiological aspect). Моskva: Nauka, 1982. 192. Print. Mrazek, R. Sintaxis russkogo tvoritel’nogo (strukturno-sravnitel’noye issledovaniye) (Syntacis Russian Instrumental (structural-comparative Study)). Praha: Státní pedagogické nakladatelství, 1964. Murzina, Lary`sa. “Vzayemodiya slovotvirnoyi kateрoriyi instrumental`nosti ta inshy`x slovotvirny`x kateрorij imenny`ka (Interaction of the word-building category of instrumentalism and other noun-word-building categories)”. Aktual`ni problemy` gramaty`ky` (Actual problems of grammar) 2 (1987): 53–56. Print. Murzina, Lary`sa. “Slovotvirna katehoriya instrumental`nosti u yiyi zvʼyazkax iz sy`ntaksy`chnoyu strukturoyu movy` (The word-of-mouth category of instrumentality in its relations with the syntactic structure of language)”. Movoznavstvo (Linguistics) 2–3 (1996): 64–67. Print. Potebnya, Aleksandr A. Iz zapisok po russkoy grammatike: [V 4-h t.] (From notes on Russian grammar) : [4 Vol.]. Моskva: Uthpedgiz ‒ Prosveschenie, 1958 – 1985. ‒ Т. ½. – 1958. ‒ 536 s.; Т. 3. ‒ 1968. ‒ 552 s.; Т. 4. ‒ Vyp. 1: susschestvitel’noye. 1985. 288; Vyp. 2 : glagol, 1977. 407. Print. Stanischeva, Darya S. “Tvoritelnyiy instrumentalnyiy (Instrumental’s instrumental)”. Tvoritelnyiy padezh v slavyanskih yazyikah / pod red. S.D. Bernshteyn (The instrumental case in Slavic languages). – Moskva: AN SSSR, 1958. 76−126. Print. Stanischeva, Darya S. “Tvoritelnyiy sovokupnosti (Instrumental aggregate). Tvoritelnyiy padezh v slavyanskih yazyikah / pod red. S.D. Bernshteyn (The instrumental case in Slavic languages). – Moskva: AN SSSR, 1958. 193−200. Print. Stanischeva, Darya S. “Tvoritelnyiy sociativnyj ((Instrumental social). Tvoritelnyiy padezh v slavyanskih yazyikah / pod red. S.D. Bernshteyn (The instrumental case in Slavic languages). – Moskva: AN SSSR, 1958. 41−75. Print. Tvoritelnyiy padezh v slavyanskih yazyikah / pod red. S.D. Bernshteyn (The instrumental case in Slavic languages). – Moskva: AN SSSR, 1958. 380. Print. Ty`mchenko, Yevhen. Vokaty`v i instrumental` v ukrayins`kij movi (Voktiv and Instruments in Ukrainian Language). Ky`yiv: Z Drukarni Ukrayins`koyi Akademiyi Nauk, 1926. 116. Print. Tihomirova, Tatyana S. “Protsess adverbializatsii tvoritelnogo padezha (Adverbialization Process of the instrumental Case)”. Tvoritelnyiy padezh v slavyanskih yazyikah / pod red. S.D. Bernshteyn (The instrumental case in Slavic languages). – Moskva: AN SSSR, 1958. 313−350. Print. Hodova, Tatyana I. “Tvoritelnyiy padezh v stradatelnyih konstruktsiyah i bezlichnyih predlozheniyah (The instrumental in passive Сonstructions and Impersonal Sentences)”. Tvoritelnyiy padezh v slavyanskih yazyikah / pod red. S.D. Bernshteyn (The instrumental case in Slavic languages). – Moskva: AN SSSR, 1958. 127−158. Print. Hodova, Tatyana I. “Tvoritelnyiy prevrascheniya i sravneniya (The instrumental Transformation and Comparison)”. Tvoritelnyiy padezh v slavyanskih yazyikah / pod red. S.D. Bernshteyn (The instrumental case in Slavic languages). Moskva: AN SSSR, 1958. 181−192. Print. Hodova, Tatyana I. “Tvoritelnyiy prichinyi (Instrumental case the reasons)”. Tvoritelnyiy padezh v slavyanskih yazyikah / pod red. S.D. Bernshteyn (The instrumental case in Slavic languages). – Moskva: AN SSSR, 1958. 158−180. Print. Brugmann, Karl. Kurze vergleichende Grammatik der indogermanischen Sprachen. Auf Grund des funfbandigen Grundrisses der vergleichenden der indogermanischen Sprachen. Berlin-New York : de Gruyter, 1922. 870. Print. Meillet, Antuan. “L’evolution des forms grammaticales”. Scientia 12 (26) (1912) : 384–400. Print. Antony`ch, Bogdan-Igor. Vely`ka garmoniya (Great harmony). Ky`yiv: Veselka, 2003. Print. Barka, Vasy`l`. Zhovty`j knyaz` (Yellow Prince). Xarkiv: Folio, 2017. Print. Bedzy`k, Yurij. Vely`ky`j den` inkiv (Great Inca day). Ky`yiv: Veselka, 1989. Print. Berdny`k, Oles`. Komentar Dazhboga (Dazhboh's commentary). Ky`yiv: Ukrayins`ky`j py`s`menny`k, 1996. Print. Bily`k, Ivan. Poxoron bogiv (Funeral of the gods). Ky`yiv:Vy`davny`chy`j dim A.S.K., 2005. Print. Bogdanov, Oleksandr. Chervona zorya (Red star): [pereklad i peredmova Ostap Ny`tka (Ye.I. Kasyanenko)]. Ky`yiv: Kosmos; [Druk. «Robitn. kny`garni], 1919 (Seriya beletry`sty`chna; № 1 (1)). Print. Vy`nny`chuk, Yurij. Divy` nochi (Grandmother's Night). L`viv: Kamenyar, 1998. Print. Vladko, Volody`my`r. Sy`vy`j kapitan (Gray Captain). Ky`yiv: Dnipro, 1959. Print. Vovchok, Marko. Vy`brani tvory (Selected Works). Ky`yiv: Dnipro, 1974. Print. VDashkiyev, My`kola. Kry`shtalevi dorogy (Crystal Roads). Ky`yiv: Veselka, 1976. Print. Dochy`necz`, My`roslav. Damy` i Adamy (Ladies and Hells). Mukachevo: Karpats`ka vezha, 2011. Print. Drozd, Volody`my`r. Katastrofa (Catastrophe). Ky`yiv: Studiya «Negociant», 2000. Print. Izars`ky`j, Oleksa. Stoly`cya nad Izarom (Myunxen) (Capital over Isar (Munich)). Ky`yiv: Dnipro, 2002. Print. Karpa, Iren. Frojd by` plakav (fFeud would cry). L`viv: Folio, 2004. Print. Kashhenko, Andrian. Opovidannya pro slavne Vijs`ko Zaporoz`ke ny`zove (Story about the glorious Army of Zaporozhye). Dnipropetrovs`k: Sich, 1991. Print. Kokotyuxa, Andrij. Nejtral`na tery`toriya (Neutral Territory). L`viv: Kal`variya, 2002. Print. Ly`s, Volody`my`r. Solo dlya Solomiyi (Solo for Solomia). Xarkiv: Klub simejnogo dozvillya, 2013. Print. Nomy`s M. Ukrayins`ki pry`kazky`, pry`sliv'ya i take inshe (Ukrainian proverbs, sayings, and so on). Ky`yiv: Dnipro, 1993. Print. Slovar` ukrayins`koyi movy` (Dictionary of the Ukrainian Language) / Upor. z dod. vlas. materialu B. Hrinchenko: V 4-x tomax. Ky`yiv: Vy`davny`cztvo Akademiyi nauk Ukrayins`koyi RSR, 1958. Print. Slovny`k ukrayins`koyi movy` (Dictionary of the Ukrainian Language): V 11-ty` t. Ky`yiv: Naukova dumka, 1970−1980. Print. Slovny`k ukrayins`koyi movy` (Dictionary of the Ukrainian Language): U 20-ty` t. Ky`yiv: Naukova dumka, Ukrayins`ky`j movno-informacijny`j fond NAN Ukrayiny`, 2010−2018. Print. Tarasyuk, Galy`na. Lyubov i grix Mariyi Magdaly`ny` (Love and sSn of Mary Magdalene). Chernivci: Obldruk, 1995. Print. Trublayini, My`kola. Shxuna «Kolumb» (Columbus Schooner). Ky`yiv: Radyans`ka shkola, 1989. Print. Xotkevy`ch, Hnat. Tarasy`k (Tarasyk). Ky`yiv: Dnipro, 2004. Print.